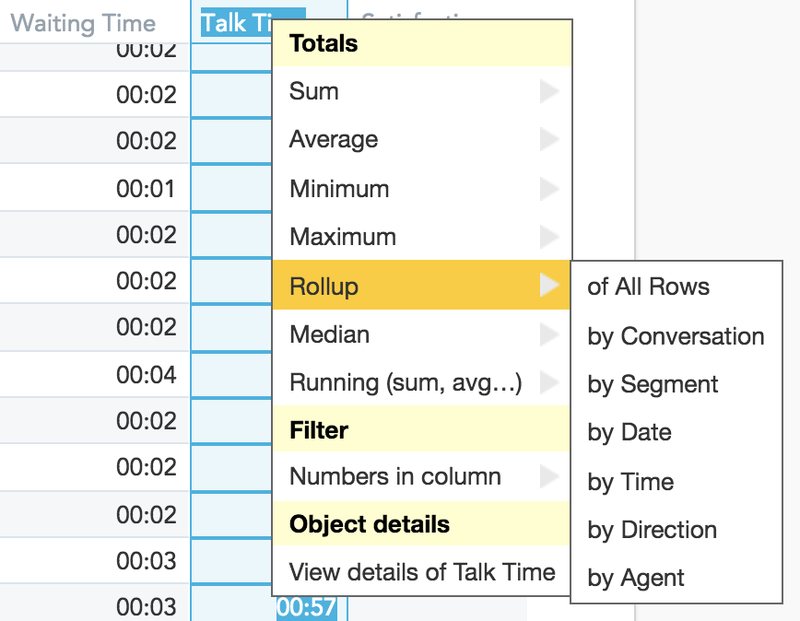 Learn how to use Flex WFO's rollup summary to create intelligent aggregation in your reports. New to Flex WFO? Learn more about Flex's Workforce Optimization dashboards and reports here. Rollup is a very powerful and important type of summary. It is an intelligent aggregation function that uses the original metric to calculate the aggregation (instead of simply summing or averaging individual rows). Summing and averaging of rows may lead to results that look like "sum of counts of sets that aren't mutually exclusive" or "averages of averages," which are not always the desired result. When you use rollup on a column that contains a count measure it does not do a simple sum of the individual rows. Instead, rollup calculates the underlying measure without the segmentation applied in the table. A sum of individual rows may cause "sum of counts" counting the same item multiple times in some cases. In the following example, we have two conversations. Conversation A has two segments as Mary forwards a call to Josh. The second conversation has only one segment handled by Mary. The segmented table attributes two conversations to Mary because she participated in them. It also attributes one conversation to Josh because Mary forwarded a call to him. The sum of rows results in three conversations because Conversation A is counted twice - once for Mary, once for Josh. The rollup does not simply sum the rows. Rather, it calculates the metric without considering attribution to Mary and Josh. When you use rollup on a column that contains an average measure it does not do a simple average of the individual rows. Rollup calculates the underlying measure without the segmentation applied in the table. An average of individual rows may lead to calculating "averages of averages" which is often not desirable. The results differ because the simple average takes the averages of all agents and then calculates the average of those averages. This value may be significantly different from an overall average talk time of individual segments.